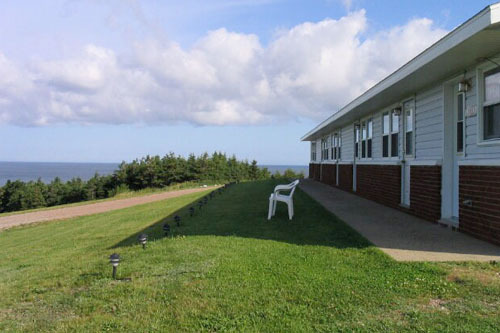 Burton’s Sunset Oasis Housekeeping Motel is nestled on a slope at the end of the fishing village of Bay St. Lawrence on the northern tip of Cape Breton Island – just a 15-minute drive north from the Cabot Trail. Enjoy the spectacular panoramic view of the mountain range, village, and ocean, and you can’t miss our amazing sunsets. Explore the nearby hiking trails, wildlife sightings, bird watching, whale watching, local boat tours, or relax on a sandy beach at Cabot Landing. We have 5 motel units (Single, Double) with a kitchenette, a 4-piece bath, satellite television, high speed Wi-Fi, wheelchair accessibility and a pay phone on the property. Gas barbecues and lobster/crab cookers are also available. Our property is non-smoking. No pets please. We are a proud member of the Tourism Industry Association of Nova Scotia. Visa and MasterCard are accepted.